I am long time outdoor activities enthusiast. I started hiking in the hills of Hungary at an early age. When I moved to Canada, I became fascinated by the Rocky Mountains in Alberta. Soon I joined the Alpine Club and became an avid climber, skier and backpacker. My activities also included marathon running, biking, camping and alpine climbing. Now I live in Kimberley in the Purcell mountains, with great places for bike riding, trail running and back-country skiing. My summers are spent in the Yukon where I pursue multi-day trips to the mountains and rivers. These boots are made to order from leather that is soft, forgiving, and they are lined with felt. The majority of my hiking and backpacking trips were taken in northwestern BC, Canada. The terrain included hilly boreal forests, mountain trails and lake shores. Elevations ranged from 3,600 ft (1,100m) to 7,600 ft (2,300 m ) and temperatures ranged from 28 F (-2 C) to approximately -10 F (-23 C) during the winter months. I have used the boots successfully for backpacking, day hiking, walking to the local stores and in combination with snowshoes. I have worn these boots for about 15 days for an average of 3 - 4 hours each time. They have been extremely versatile boots. When using them with snowshoes I usually cover about 10 miles (16 kilometers) on the trails in the Kimberley Nature Park in BC. If the trails have packed snow or ice, then I slip a pair of spiky polarcleats over the boots for good traction and leave the snowshoes at home. They are so easy to wear. I just insert my feet into the boots, use the velcro strap to tighten, adjust the laces and tie a knot on each boot. 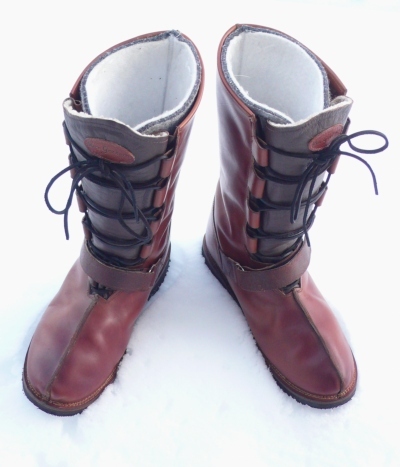 Unlike many other winter boots, Van Gorkom felt lined boots are not made of rubber. Rubber boots can trap moisture from sweaty feet. In cold temperatures condensation freezes, leading to ice encased feet. The quality leather used in the manufacturing allowed moisture to evaporate during my hikes, keeping me warm and dry. And they kept my feet very comfortable when I stopped to set up camp. Leather takes constant care, and after a few outings, they needed to be waxed again to be waterproof and supple, using a wax rather than any oil based product. Sno-seal or one of the Nik-wax products work well as they are bee's wax based. These boots are my constant companions for long walks in the snow as they are made of soft leather and feel just like moccasins. They are 14 inches (35 cm) high, so they keep out the snow even as I walk in some deep fluffy stuff. Everyone I meet remarks on the workmanship, noticing the soft leather and unusual handcrafted style. While the Yukon boots look large, they are actually lightweight, each one weighs 1 pound 12 ounces (800 grams), much less than most hiking boots, making it less effort to make trails in the fresh snow. They are handmade of full grain leather and are waxed and oiled for water repellency. They are highly flexible and include a removable felt liner, to insulate well even at -40 degrees. The soles are a Vibram sole with good traction on the snowy trails. I am very happy with these boots as they allow me to participate in winter outdoor activities regardless of the temperature or amount of snow on the ground. The boots are comfortable for walking in deep snow. They are easy to use on icy surfaces when I wear polar cleats over the sole. And the boots are perfect to use with snowshoes on long trail hikes into the bush and on mountain excursions. The boots are versatile enough to be used in the city, commuting, shoveling snow, working around a cabin, while sitting in camp, or going dogsledding. They are not made for technical mountaineering or rock climbing, as they are not stiff enough for use with crampons, but they will work well in all other cases. These boots can be repaired and re-soled to give me years of trouble free usage. They are very warm, 14 inches (35 cm) high and very comfortable. My feet don't get cold or wet, and the snow never gets inside the boots unless I try to walk into deep snowdrifts. They are waterproof and protect me well from the cold and snow, while being lighter in weight than other winter boots. The fit is a little large, I need to wear 2 sets of thick socks for a snug fit. The laces and velcro straps are very long, I need to trim those a bit.